Beginning in July 2009, the City of Vancouver has permitted laneway housing in some single-family neighbourhoods. 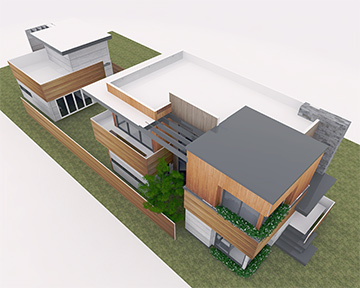 A number of residents are adding laneway homes to their existing property, while others have decided to build them alongside their new construction. On average, 11 laneway house permits were issued per month during the first 100 laneway homes built in Vancouver, according to a study done by the city. 970 LWH have been approved and 464 have been given final inspection as of May 2013, since January 2013 there have been 57 finals approved. Laneway housing is a detached dwelling on a single-family lot, usually facing the back laneway where the garage is located. One parking space (minimum) is required on all lots with a laneway home. Houses that already have a secondary suite are still eligible. Note that STRATA TITLING IS NOT PERMITTED, as these dwellings are non-saleable. Laneway housing can be built in 1 and 1½ storey configurations. The maximum floor area can be determined by multiplying the lot area by 0.125. On standard 33’ x 122’ lots, this allows a maximum of an approximately 500 square foot home. On a 50’ x 122’ lot, this allows a maximum of approximately 750 square feet.